Twinbels, semiconductors, electronics industries, microscope, measuring instruments. Leine & Linde standard range of encoders meet most requirements. It comprises everything from miniature encoders to heavy-duty encoders, in both incremental and absolute versions. 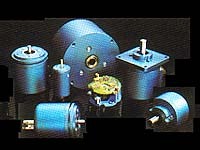 The range is supplemented by a wide assortment of customized encoders. Output Signals 1,2,0 + inv. 1,2,0 1,2,0 / 1,2,0 + inv.